Sign up for our newsletter. You will receive up-to-date information on the "Ringing Cedars" movement, as well as news, informative articles, our promotions, and more! August 12, 2008 - Ringing Cedars Conference with Vladimir Megre in October 2008. The Ringing Cedars Confernce is scheduled for October 10, 2008 in Istanbul, Turkey. Visit the official Ringing Cedars Conference page for more information. October 22, 2007 - New products available! New Essential Oils of Siberian Cedar as well as 100% Natural Chewing Gum from the Resin of Siberian Cedar and Resin of Siberian Larch are now available in our store. March 24, 2007 - New Harvest has arrived! January 24, 2007 - Internet Conference with Vladimir Megre! We are delighted to announce the start of our Online Conference with Vladimir Megre, the author of the Ringing Cedars of Russia series. The conference is specifically for English-speaking readers of Vladimir Megre's books and will be in the form of written questions and answers. Anyone can ask Vladimir Megre questions on topics of interest. You will be able to ask your questions over a period of a month starting January 24 and finishing February 24. The most popular questions will then be submitted to Vladimir Megre. The interview with Vladimir Megre and his responses to your questions will be published on March 12. January 22, 2007 - www.RingingCedarsofRussia.org new online store! We are happy to announce that or online store has been redesigned for your convenience. Now you are able to create a personal account for where you can quickly and easily place new orders as well track your existing orders. Also, and a variety of new products has been added to our Yarmarka. 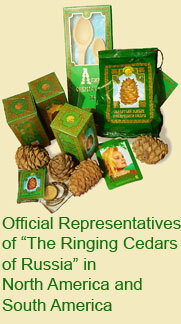 Click here to visit the Ringing Cedars of Russia online store. November 15 , 2006 - Coming soon to DVD - "Bright Tidings"
The new upcoming film of the Shetinin's School called "Bright Tidings " reveals many alterative poins of view on the subjects of education, spirituality, health, human interaction, and more!.. The movie is been translated into English and subtitled. You can preorder your copy of the film on our website. Release date is scheduled for the end of February. October 18, 2006 - www.RingingCedarsofRussia.org is completely secure! We always care about our customers and visitors of our website. Now we provide the strongest SSL secure technology for website browsing and e-mail sending. For more information please visit our Security Policy page. October 17, 2006 - New harvest will arive in October 31, 2006! October 15, 2007 - Now you can use all of our services 24/7/365! We press towards to the highest level of customer service, now we provide 24/7/365 customer suport and order taking services by phone. April 26, 2006 - Book 5 Announcement! It is our pleasure to announce that Book 5 of the Ringing Cedars Series, titled "Who Are We? ", is scheduled for release late October - early November. You can pre-order your copy of Book 5 now and it will be shipped to you as soon as it becomes available. Book 4 of the Ringing Cedars Series, Co-creation, is released. Book 3 of the Ringing Cedars Series, The Space of Love, is released.